Harry N. Abrams, 9781419723032, 256pp. Bill Nye is a science educator, mechanical engineer, television host, and New York Times bestselling author with a mission: to help foster a scientifically literate society. Gregory Mone is a novelist and science journalist who has written several books for children. He lives in Martha’s Vineyard, Massachusetts. Gregory Mone is a novelist and science journalist who has written several books for children. He lives in Martha’s Vineyard, Massachusetts. "An adventure replete with both cool gadgets and working scientists of both sexes...The cast and plotline are strong... and two appendices fill in details about Antarctica and some of the episode’s techno wizardry. For inveterate geeks, there’s even a relevant science project!" "Fast-paced enough to engage even reluctant readers, informative without being didactic, and entertaining: a solid series start." "The scientists are diverse, the educational and entertainment values are high, and there’s even good end matter (a fact vs. fiction section on what was real in the novel, cool information about Antarctica, and a science experiment), making this a promising series start." 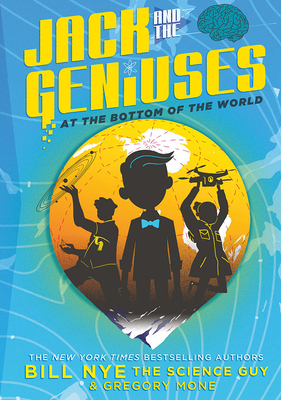 "Readers will appreciate Jack’s humor and candor...although he may not be an official “genius,” intelligence takes many forms. This fast-paced, science-themed mystery is a strong first outing, sure to leave readers awaiting this team’s next adventure." "This is a fantastic start to a new series that includes STEM concepts, facts, and excitement about the scientific world."